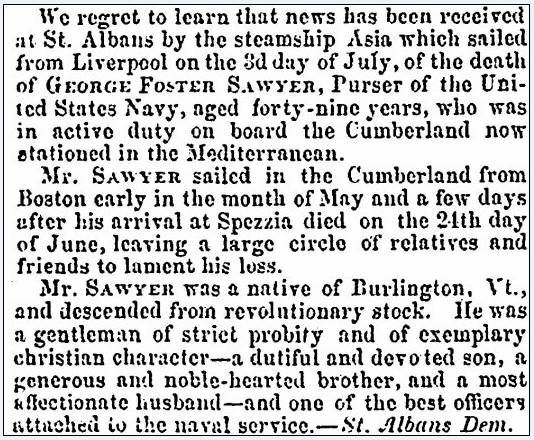 George Foster Sawyer served in the U.S. Navy and died in La Spezia, Italy, in 1852. He was a native of Burlington, Vermont. Hmm…so where do you look for his obituary? Since Sawyer was a native of Vermont, you’d expect to find his obituary in a Vermont or other newspaper from New England. I did find an obituary for him in a Vermont paper, but it was brief and to the point. I was hoping to find more information about Sawyer, so I kept on looking around in the obituary archives. Then I found another obituary for him, this one published in a New York newspaper. It gives us more of the details of his life, like the name of the ship he served on, the date it sailed—and even the fact that his ancestors served in the American Revolutionary War. It turns out his obituary was picked up by newspapers up and down the coast, each giving a little bit more information than the short Vermont obituary. Genealogy Tip: Keep digging in the obituary archives—don’t limit your search to just the hometown area of the deceased. 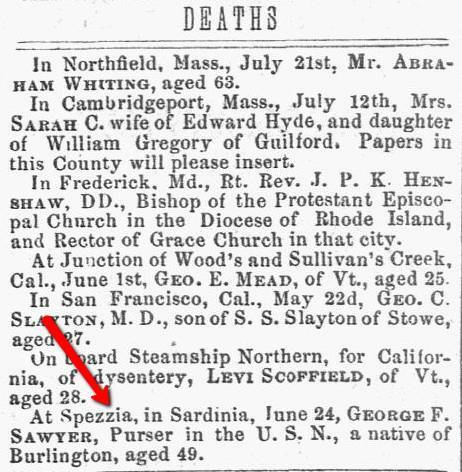 Obituaries can be published in newspapers you would never expect, far from where your ancestor lived or died. Thanks for the tips. Hopefully it will help me locate my missing James. Great point for sure, Tom! But Plattsburgh, New York WOULD be Burlington, Vermont’s “hometown area”, as it’s right across Lake Champlain, 21 miles northwest by seagull. Even today, the TV channels are Burlington/Plattsburgh. So, just saying that this is a poor example to emphasize a great point. Now, if it was a BUFFALO paper… “Know your geography” should precede this tip, as I would’ve looked at the Plattsburgh papers as well during the INITIAL search for Mr. Sawyer’s obit. Ditto for St. Albans, Vermont, where the original Plattsburgh obituary appeared. As you say – this is a great example. We see that too many researchers limit their research to only ‘one’ state or ‘one’ city. If they did this using this example they would miss these important articles that gave key information about their ancestors. It’s important to be flexible and not restrict the geographic too tightly. Good luck with it Olivia.